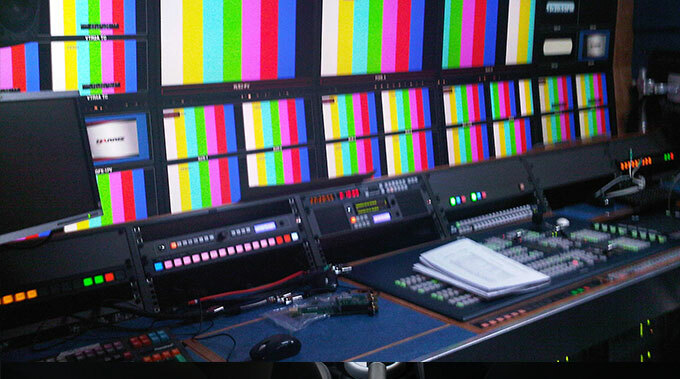 As a specialist in picture monitoring, working with broadcasters and outside broadcast companies worldwide it is important to address this issue from 'both ends' in order to provide optimal solutions for each client's specific environment. So what is 'both ends? Often, there are commercial drivers from suppliers that become predominant in people's decision making either towards large screen and multi-viewers or towards a larger number of single source picture displays and it really depends who you talk too. However, we are technology 'agnostic', having an enormous range of monitors and multi-viewers and like to look at the fundamentals as a challenge to derive the optimum viewing experience for the operational environment. Firstly, to dispel a popular myth, it can often be lower cost to have dedicated picture monitors rather than using a multi-viewer. There is a cross over point at around 80 signals, where large multi-viewers can be more cost effective. The key to this is having the right picture displays and many manufacturers do not have any designed specifically for purpose, but generally produce expensive multi-purpose monitors which are over engineered and there can be a very limited range of models to choose from. In many instances, large digital signage monitors are used but whilst they can be an attraction they do not conform to EBU recommended standards for colour and brightness which leads to a mismatch within a facility. Recognising the trend in monitor walls High Performance Media Technology specifically designed a range of low cost, fit for purpose picture monitors with broadcast colourimetry and backlight levels that were specifically designed for use in galleries and monitor walls. Getting the monitors right is fundamentally important, not just commercially but ergonomically and for the humanistics of operators, some of whom can spend all day on shift watching the screens. Getting the budget right for a 'stack' build is crucial to the success of a project, but which way is right, single source monitors or multi-viewers? For example, a stack with 64 x 9.7" monitors cost less than a 64 input, 4 output multi-viewer system and 4 x 42" screens. Having dedicated source monitors provides better redundancy and system resilience. Secondly, the picture quality from 9.7" monitors is far greater (1024x768 resolution) than say a 16th of a 42" monitor, which equates to a resolution of 480x270. So, in this example a dedicated single source monitor solution is not only more cost effective but gives better picture quality and improves reliability. For walls from 64 to 96 inputs, using 16 x 21.5" with quad multi-viewers can be most cost effective and has reliance against equipment failure in its favour. There is only so much that human eyes can take in and with more than 64 signals it is often beneficial to have automatic signal deficiency and loss detection for both audio and video and hence why, in this example, we suggest using quad multi-viewers which incorporate such functionality. With 21.5" monitors the effective resolution per quadrant is 960x540 and significantly better than 480x270 you'd get on a 42" monitor showing 16 signals. When there are more than 96 video signals the equation is commercially balanced towards large monitors and multi-viewer systems. Further consideration should be given to the choice of large monitors. When a HD image is scaled down by a multi-viewer to, for example, a 480x270 pixel size the loss of detail can be quite dramatic, particularly on screens not designed for monitor walls. It is therefore important to give consideration to using higher quality screens that will show scaled down logos, captions and crawling 'tickers', such as 10 bit LCD panels. A 55", 10 bit LCD screen will show far greater detail than a 65", 8 bit LCD screen, for example, so, size isn't everything! Finally, in this brief article, it is important to consider the operators. When sitting, the human head is most relaxed when vertical and therefore an extension to the spine; in this position the focus of our eyes is horizontal and our peripheral vision is +/- 15 degrees from the horizontal. Putting any monitors above 2 metres makes no sense at all, when sat 2 metres way as it can lead to neck strain. The EBU recommends monitor brightness at 85Cd as this is when the iris in your eye is most relaxed and therefore humans are less likely to suffer from eye strain, particularly when working on long shifts. Digital signage monitors are too bright because designed to viewed in shopping mall from some distance and likewise televisions are often +120Cd because this accentuates colour perception to our eyes. Managing colour and brightness of monitors is essential to avoid eye strain and headaches and there are systems around that will ensure that the monitor set up is correct which in turn, helps with a happy working human, environment. We hope this article has been useful, giving some consideration to the design of monitor walls, from a technology perspective, to commercial considerations and to humanistics.